Back from retreat and right into new duties as studio manager for geoYoga– on top of some other big changes. Things can be pretty scary sometimes, can’t they? However: I am encouraged by my students and friends, those I meet on the path, to be strong, to remember that all things are temporary, and that we can find some measure of ease even in the discomfort. I am grateful to remember that you don’t always have to do things alone. I am reminded that I am not the first person to face these challenges. 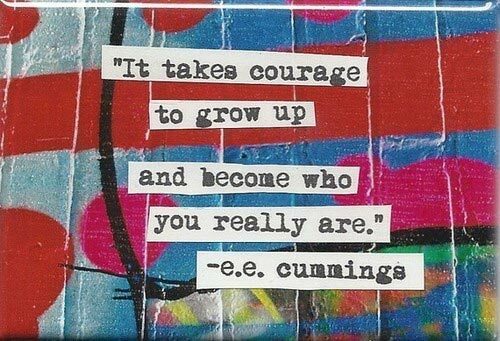 I see signs that I’m growing up, and, as ee cummings says, that takes courage. Etymologically speaking: have you ever noticed that the word “encouraged” includes the word “courage?” Seems silly now, but I hadn’t seen this until today. The idea that in being encouraged, you are given courage- how brilliant, simple, and true. I am given courage by my community, by my family, by what is called in the yoga and Buddhist traditions a sangha. There have been times in my life where I did not know how to ask for help- or I thought I didn’t deserve the help- or maybe I was just afraid to look like I needed help. Now, I can look with eyes of love at the compassion and kindness of my family and friends (I never knew how many I had!) and know that sometimes it’s just your time to receive. Move toward whatever nourishes you- to whatever illuminates the path for you. I’m sharing her words with you as well, in the hopes that you may find courage there when you need it. Finally, noticing how the quality of courage can change as we grow and mature, I am inspired by this beautiful poem that I’ve used in class recently. I hope you enjoy. This entry was posted in Gratitude, Inspiration, Poetry and tagged courage, courage by anne sexton, it takes courage to grow up on January 16, 2013 by laurasana. And tell me please my friend, how is this NOT yoga related? How much courage I have needed in class, and how much ENcouragement you have given me! I continue to learn, through teachers and friends and the many tools they (you) have given me, that yoga gives us, and requires of us, courage…on and off the mat.